According to some health experts, nature holds the key to life. Fresh air, beautiful flowers and the feel of grass underfoot inspire a positive outlook. Going one step further, some health experts believe that an appreciation for the natural world lowers blood pressure, boosts the immune system and reduces stress. Question the stress reducing effects of nature all you want, but how do you feel when you look at a lovely flower? Or smell freshly cut grass or a eucalyptus tree? Nature tends to put our minds at ease. By closely looking at or concentrating on something calming, everything else you’re thinking about tends to melt away. You naturally stop obsessing or worrying about what’s on your mind, and you’re brought into the present moment. Your heart rate lowers and in turn, so does your stress level. This is known as horticultural therapy. In fact, there have even been some cases in hospitals where patients who have a beautiful view of a garden or plants feel less pain and recover more quickly. Any movement is good movement. So no matter how small a space you’ve got to work with, the fact that you’re still moving about is fantastic for your overall physical health. A recent report published in the Daily Mail UK stated that people who spend their time pottering in the garden are considerably trimmer and healthier than their non-gardening counterparts. The physical elements of gardening, while they may be considered light, still get your blood moving. Digging, planting, bending and stretching use key muscles in the body meaning gardening is an excellent form of low-impact exercise. It gets you moving, without tiring you out or injuring yourself, as long as you bend and stretch correctly. 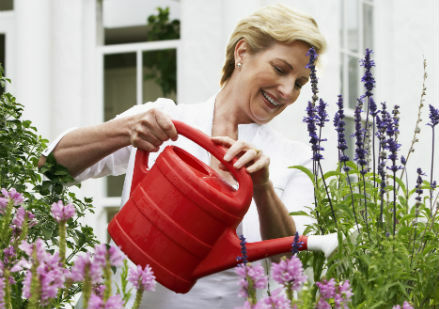 Plus, because gardening is goal-orientated, you’re more likely to stick to it rather than simply ambling around the neighbourhood occasionally. Most of the time, it won’t even feel like exercise. Organised effectively, your garden can be a money-saver too. Not only will eating fresh vegetables improve your physical health but by planting the herbs and vegetables you use in your cooking just outside your back door, you’ll no longer need to head to the supermarket to pay for them. Do you have space for a tree outside? Lemon trees can definitely come in handy to use the fresh fruit for cooking, in ice-cold water or in your tea. Gardeners tend to eat more fresh fruit and vegetables, purely because the healthy foods are right there in the garden. It’s also a sense of achievement – if you’ve planted and nurtured the fruit and vegetables, why not eat the fruits of your labour, literally? The good news is you don’t need a huge garden to reap the health rewards of nature. A simple herb garden at your window or on your balcony, a stroll through the park or a lot in a community garden will give you the same benefits. In fact, just having some houseplants around will help with your mental health. Do you have a windowsill that gets plenty of light and sunshine? Use a planter box and plant your herbs there. It’s a fresh upgrade to any window. You can also use planter boxes in any courtyard or on your balcony. Remember to ensure the plants have access to loads of sunlight. But they still need some shelter in the case of wind or heavy rain. Also, make sure there is a tap nearby for watering so you’re not lugging around a large watering can, but ensure the surface won’t get too slippery when the plants are watered. Keeping your garden green and fresh is really quite simple. Water it regularly, weed often and don’t use any chemicals or pesticides. Natural products are always the way to go, especially if you plan to eat your produce. The key to gardening is also to protect yourself. Always wear a hat and sunscreen if the sun is out, plus protective gloves, especially if you’re weeding. Make sure you’ve got solid footwear on and if you’ve got particularly bad knees and you plan on kneeling down, a good idea is to invest in some kneepads. Take regular breaks and stay hydrated with plenty of water for you too.